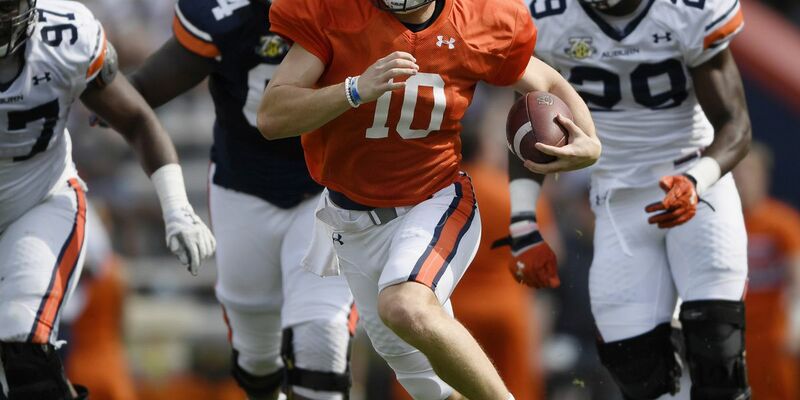 AUBURN, Ala. (AP) — Gus Malzahn said all four of his quarterbacks made some big plays in the spring game. A more detailed public assessment, and any comment on the pecking order, will just have to wait. "We've got quite a few of them we feel like can move the offense," Malzahn said after Saturday's A-Day game. "We've got good information and next week we'll assess everything and see where we're at. We want some order after spring. I think we'll be able to get to that point." Four contenders with scant experience among them have battled all spring to replace two-year starter Jarrett Stidham. The most heralded is freshman Bo Nix, an early enrollee, but Joey Gatewood, Malik Willis and Cord Sandberg have also been in the mix. They combined for five touchdown passes in the spring game. Wide receiver Seth Williams said Auburn's in good shape at quarterback whoever wins the starting job. "We're good. We've got a quarterback," Williams, who caught two touchdowns from Gatewood, said. "We've got four quarterbacks and one of them's going to be our guy. All of them are just good, so we're not going to have a problem there." Malzahn hasn't offered details on a pecking order, though Gatewood and Nix took turns leading the first-team offense in the opening half. Malzahn didn't announce that Cam Newton, who wound up winning the Heisman Trophy and leading Auburn to the 2010 national title, had won the job until days after the 2010 spring game. —Nix is the one of the team's most prized recruits. The son of former Tigers quarterback Patrick Nix, he was rated the nation's top-rated dual threat quarterback by the 247Sports composite rankings of the major recruiting sites. He led Pinson Valley, coached by his father, to back-to-back Class 6A state titles while setting Alabama high school records for career total offense and touchdowns responsible for. Nix started strong, setting up a touchdown pass with a 38-yarder to Williams. He rolled right under pressure and fired back toward the middle for an 11-yard touchdown to Eli Stove, who's returning from a knee injury that sidelined him most of last season. Nix added a 49-yard touchdown pass to Matthew Hill late in the first half. His numbers: 11 of 16, 155 yards, two touchdowns. "He's improved a lot, but that's to be expected," Malzahn said. "He's a true freshman and still should be in high school. The college game's different and of course the speed's different and our defense is different. It's been good for him to get used to everything that goes with it." —Willis is the most experienced, since he's the only one of the four with more than one college pass attempt. But he has twice as many career runs (28) as passes (14). His numbers: 7 of 8, 63 yards, TD. Willis got off to a good start with a 41-yard over-the-shoulder touchdown to Hill against the first-team defense. He was 5 of 5 for 64 yards on the drive. —Gatewood is a 6-foot-5, 237-pounder who saw his only collegiate action in the Music City Bowl, running three times for 28 yards against Purdue with one pass that fell incomplete. He struggled in last year's spring game as an early enrollee like Nix. This time he was 8 of 12 for 130 yards and a pair of touchdowns. "He's a different quarterback than he was at this time last year," Malzahn said. "He does have more confidence. He really has been focused and really desperate to win the job. He's had a very good spring." —Sandberg is a former minor league baseball player. He was 8 of 9 for 54 yards. NOTES: Defensive tackle Derrick Brown, Williams and Anders Carlson were named defensive, offensive and special teams MVPs, respectively.